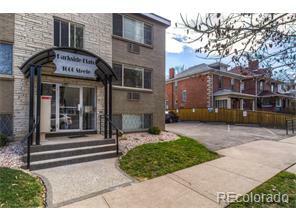 Gorgeous high end condo in Mid Mod building right off of City Park! Completely remodeled in 2010. New cherry hardwood floors, designer paint, appliances ~ including a stackable laundry center in the unit, mechanicals, everything! Includes parking space, bike racks, and a dedicated storage unit. Great neighbors, and very well cared for building. Walk to Sprouts market, City Park jazz, Denver Zoo, Museum of Nature and Science, great restaurants, The BlueBird Theatre, and much more!